“We in UKIP deny climate change alarmism supported by green lobbies, often financed by the Commission, …“&c, &c, &c.
When she says “green lobbies” what she means is mainstream climate science which is uncontentious. It is quite extraordinary that one of Britain’s political parties has a stated policy of climate change denial when the world’s science academies, governments and the United Nations consider it to be the most serious issue of our times. It is also extraordinary that our MP Mr Jacob Rees-Mogg seems to share these unscientific myths that make up the UKIP energy & climate policy, see Climate change alarmism cause our high energy prices and Carbon Emissions and Climate Change. 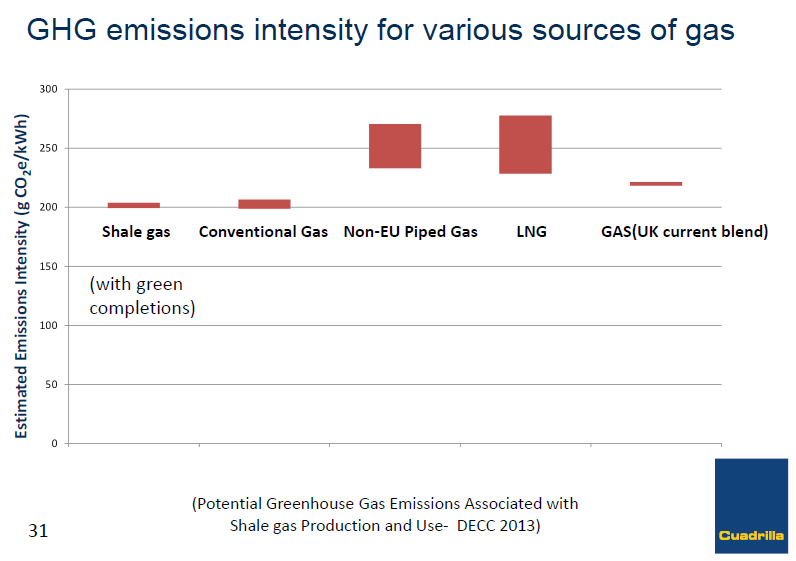 On cheap energy Mr Rees-Mogg has said “Hydraulic fracturing may be part of the solution but carbon emission targets will not be” but his figures on renewables are all muddled up and based on bad journalism rather than credible sources. and follow up with their evidence and causes resources. NB Science has know about this for well over 100 years. 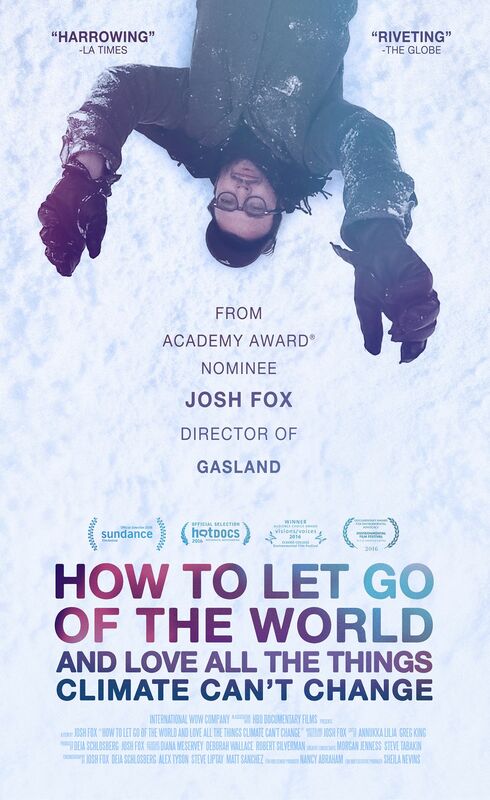 You are invited to a special screening of How to Let Go of the World and Love All the Things Climate Can’t Change followed by a Q&A with Josh Fox (Gasland). Wed, Oct 12, 2016 5:30 PM. 3 days left to book a ticket! Why are we promoting this film? Because unconventional gas, like the gas in the coal beneath the Chew Valley, is a fossil fuel that can’t be exploited if we want to prevent disruptive climate change. Get involved, start talking ! “I also understand that some people would like the Government to spend more money on renewable energy instead of nuclear power. It is important to remember that the United Kingdom produces approximately only 2% of the world’s carbon emissions. It is, therefore, more important that the UK Government ensures that the most vulnerable people in society are protected rather than producing renewable energy that, even though it may be greener, is nonetheless unreliable and would raise energy bills for everyone. Households are already estimated to be paying £60 per year which may rise to £226 by 2020 owing to subsidies for renewables. I have included an article explaining this potential rise for you reference“. Giving this Telegraph article as evidence. It sounds reasonable but what lies beneath this logic and evidence? It is true that the UK only produces about 2% of the world’s annual carbon emissions but it is our cumulative emissions that define our climate change impact. As the UK was at the forefront of the Industrial Revolution we have a head start on the rest of the world and we come 7th in the world’s cumulative emissions ranking after the USA, China, Russia, Brazil, India and Germany. On a per capita basis the UK has historically produced more CO2 emission than any other country in the world. That is quite an achievement. This places a heavy moral responsibility on the UK to take a lead in reducing our national and per-capita emissions considering that we have already hogged such a dis-proportionate slice of the world’s safe carbon budget. See National contributions to observed global warming. Fulfilling this moral responsibility (to both the rest of the world and to future generations) to reduce emissions is not mutually exclusive with fulfilling our moral responsibility to help those in our society in fuel poverty. Presenting it as an either/or choice is a false dichotomy. Those in fuel poverty can be helped with energy efficiency measures or by putting the costs of developing renewable energy onto general taxation rather than on bills, so that those who can pay do pay. This does not preclude also dealing with climate change. Similarly, dealing with climate change using renewables doesn’t mean living in caves – another of Mr Rees-Mogg’s false dichotomies. What of Mr Rees-Mogg’s assertion that renewable subsidies on household bills “may rise to £226 by 2020”? In a nutshell Mr Rees-Mogg has cherry-picked a confused and incorrect journalistic article (from a paper he writes for) rather than referring to the transparent analysis of the government’s statutory advisors. He also ignores the vastly larger subsidies that are given to the fossil fuel industry. So, Mr Rees-Mogg i) misrepresents the UK’s contribution to global warming, ii) makes a false moral argument about fuel poverty based on i, and iii) uses a set of incorrect statistics to exaggerate renewable subsidies whilst ignoring fossil fuel subsidies and readily available credible estimates from authoritative sources. Mr Rees-Mogg quotes from an article by the Telegraph’s deputy political editor Stephen Swinford (19/3/2015) who says “Green levies on energy bills will treble by 2020 because of renewable targets, official figures suggest”, attributing the figures to the Office of Budget Responsibility, although Mr Swinford gives no source for the figures which seem impossible to verify, including by climate sceptic bloggers. Mr Swinford adds “Separate figures published last year show that the policies account for 5 per cent of energy bills at present – equivalent to £68 a year – to 15 per cent of an annual energy bill by 2020, equivalent to £226”, quoting the Telegraph’s energy editor Emily Gosden (6/11/2014) in Green levies on energy bills to double by 2020, official estimates show. However, Mr Swinton isn’t quoting Ms Gosden he is miss-quoting her and has taken the estimated 2030 subsidy and moved it to 2020 creating not a doubling but a trebling of the subsidy by 2020. As presented in Ms Gosden’s article the correct figure for 2020 is £141, not £226. Mr Swinton ploughs on regardless and quotes from a report by the Centre for Policy Studies (18th March 2015) saying “Scrapping the UK’s green energy targets in favour of gas-fired power plants would save consumers £214 a year by 2020, the report suggests – despite ministers’ insistence that the total impact of the policies will be only £141 per household by then”. So having replaced the government’s 2020 estimate with the 2030 estimate, as reported by his energy editor colleague, he then mistakenly uses another report referring to 2020 to erroneously justify the mistake he has made whilst also mentioning the correct figure for 2020 of £141. This is seriously shoddy journalism on the part of the Telegraph, but it gets worse. What is this Centre for Policy Studies (CPS) report, what does it say and who wrote it? The report’s main message is that “ditching the renewables target and returning the sector to the market would save households around £214 a year, assuming gas replaces renewable power” and that “This option would depend on securing a permanent opt-out from the EU renewable directive”. The report concludes, “ditching renewables and encouraging shale fracking is better economics and more effective at reducing carbon dioxide emissions”. These conclusions are based in part on work by Professor Gordon Hughes for the Renewable Energy Foundation (REF) and emails to the CPS report author. Professor Hughes has produced reports on wind power for both REF and Lord Lawson’s Global Warming Policy Foundation (GWPF). Both REF and GWPF are climate sceptic and anti-renewable energy, although this may not be immediately obvious to the casual viewer of their web sites. The GWPF has been a relentless promoter of hydraulic fracturing. The director of REF is GWPF’s energy editor and has recently joined the GWPF’s, so called, Academic Advisory Council. Professor Hughes’ work on wind for these organisations has been robustly debunked by the late by Prof David MacKay of Cambridge University, by Imperial College and by the UK Energy Research Centre. CarbonBrief also comment. In her Telegraph article reporting on the CPS report Emily Gosden said the DECC points out (but Swinton ignores) that “The figures in this report don’t add up and ignore the urgent need to cut our carbon emissions.” DECC unusually published a rebuttal of the CPS report saying “The report today by the Centre for Policy Studies ignores the reality of the energy market. 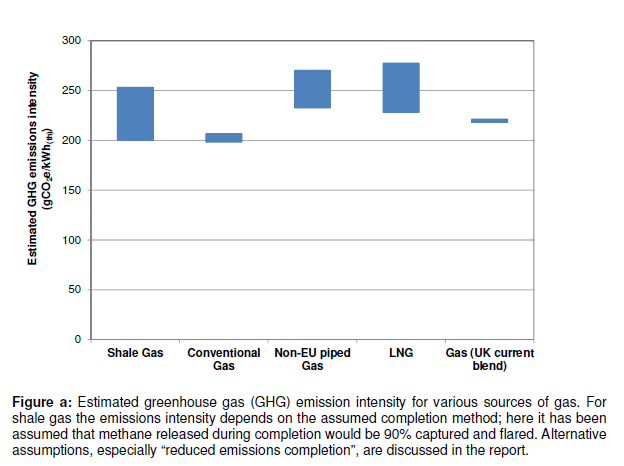 It wrongly suggests that we can ditch renewables for gas, with no explanation of where we would source that from. It also appears to suggest that we should row back on the tremendous gains we have made in the fight on climate change. Given the dire consequences of global warming this is not an option”. The CPS report was written by Rupert Darwall who is a prominent climate sceptic and who has published with the most prominent climate sceptics some of whom have been outed as being paid by the fossil fuel industry. What do the various renewable subsidies actually mean for household energy bills? 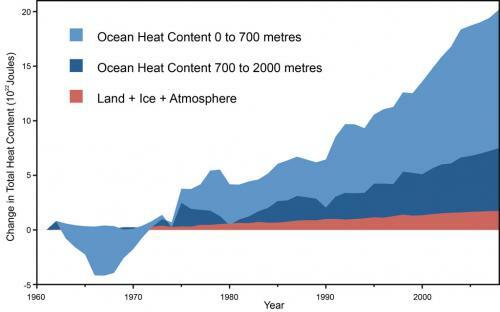 CarbonBrief provided a clear explanation of what these figures mean (7th November 2015). As we move forward these estimates will change and Mr Rees-Mogg would probably do better to read the government’s statutory advisor’s report Power sector scenarios for the fifth carbon budget (October 2015) with analysis by Imperial College. This shows that the likely cost to consumers of renewables in 2020 is £105, not £226 nor £214 or even the £129 in the above graphic. And for that we get to meet our climate change commitments and deal with renewable intermittency issues and support households in fuel poverty. Why does Mr Rees-Mogg choose to use unreliable information sources rather than the robust and transparent analysis of the Committee on Climate Change? In the South West we are represented in the European Parliament by six MEPs one of whom is Dr Julia Reid who is also the UKIP science spokesperson. MEPs represent us in the parliament and are responsible for passing European laws, establishing the EU budget, etc. UKIP policy is not just Euro-sceptic it is also climate-sceptic and firmly rejects climate science and advocates the use of fossil fuels including fracking. In the European Parliament debate on the outcome of the recent Paris Climate Conference, at which the world’s nations committed to act to avoid dangerous climate change, Dr Reid gave a speech in which she repeats a number of well known climate myths frequently used by UKIP and the fossil fuel PR machine. Let’s see if Dr Reid’s assertions have any basis or if they are well known myths debunked by the scientific community. Since 1880 the 16 hottest years on record are the last 16 years. This is a well worn climate myth championed by Lord Lawson’s fossil fuel lobby group the Global Warming Policy Foundation quoted in the UKIP policy documents. The myth cherry picks by using a starting point of a hot El Nino year (it is normally 1998 not 97) and ignores the fact that the land, the atmosphere and melting ice only account for about 3% of total warming with most of the rest being taken up by the oceans. NB in February 2016 we are towards the end of the latest El Niño event. To study climate we have direct climate measurements for the past 250 years or so and we also have proxy measurements covering millions of years. This myth ignores the fact that we have a multitude of climate data sources in addition to recent direct measurements, including ice cores, tree rings, lake sediments, knowledge of orbit variations, etc. The climate has changed greatly over geological time and science has a good idea of why these changes have taken place. Dr Reid’s Myth 3 – “I don’t dispute there has been climate change, there has been for thousands of years. A thousand years ago we had the Medieval warm period, before that we had the Roman warm period, before that we had the late Egyptian warm period and before that the Minoan warm period.“. These warm periods were caused by a combination of factors including the Earth’s orbit, volcanic activity and solar output and are understood by science. Science also understands that the dominant factor causing warming now is the greenhouse effect caused by manmade CO2 emissions and that the other natural factors are currently secondary. Variations in the Sun’s output are an obvious factor in the Earth’s climate but science knows that a) the current warming is caused by atmospheric CO2 concentrations not the Sun and b) the Sun is currently entering a quite cooling period, not a warming period. 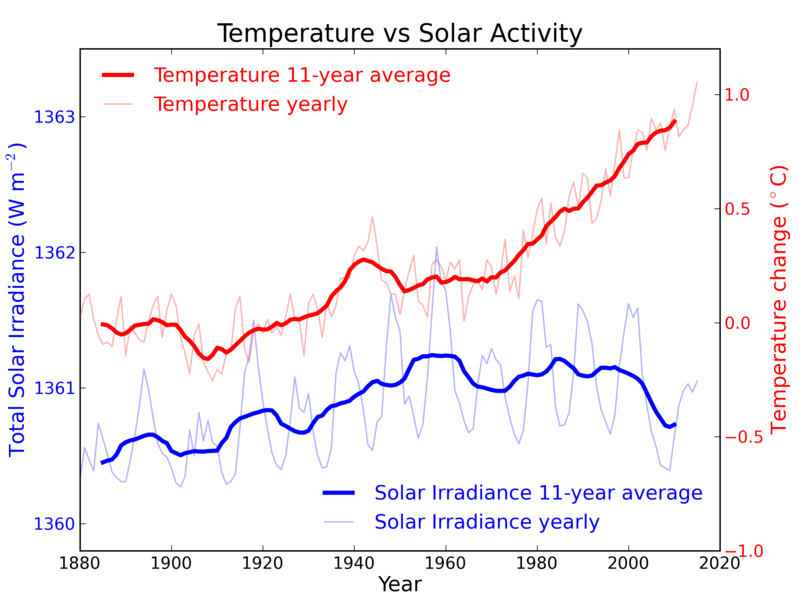 Dr Reid is attributing past warm periods to variations in the Sun’s output whilst at the same time ignoring the fact that despite the Sun currently entering a cool phase temperatures are rising. She rationalises this by denying that temperatures are rising. Dr Reid’s climate scepticism is not just her opinion, it is stated UKIP policy. It is also a counter narrative to the global science community’s robust analysis of the full range of evidence which has been accepted by the nations of the world in the Paris Climate Agreement which aims to avert dangerous anthroprogenic climate change. Are you happy to be represented in the European Parliament by proponents of climate ignorance, no matter what party they come from? The science videos in this posting are all from the University of Queensland, Australia. Dr James Hansen, former head of NASA’s Goddard Institute for Space Studies and one of the world’s most prominent climate scientists, has just said of UK’s dash for fracked gas – “Well, that’s screwing your children and grandchildren. Because if you do that, then there’s no way to avoid the consequences [of] multi-metre sea-level rise. But we can’t do that and that’s what the science says crystal clear. And yet politicians pretend not to hear it, or not to understand it” [hear it all here]. This is rather relevant to Somerset seeing as the whole coast from Clevedon to Minehead is both being licensed for fracking and much of it is close to or below the current high tide level, which is considerably higher in the Severn Estuary than other coastal areas around the UK thanks to its geography. Legally protected wildlife habitat in the Estuary is already being squeezed between rising sea level and the hard sea defences that snake around the coast, with new habitat having to be created through managed retreat at the cost of tens of millions of pounds – Steart Marsh. The Department for Energy and Climate Change is also having to ensure that sea defences at Hinkley Point are bolstered to prevent them being undermined by the rising tide. A grotesque tautology is now in play whereby the sea level is already rising and protected wildlife habitat is being lost, having to be replaced at great cost, at the same time the area is being licensed for fracking that will result in more cumulative greenhouse gas emissions, leading to more sea level rise and more habitat loss and expense – all within plain sight of a nuclear power station and the site of the Swansea Bay tidal lagoon. You really couldn’t make it up. Nor could you make up the job description of the Secretary of State for Energy and Climate Change who (thanks to the Infrastructure Act) is now simultaneously responsible for both reducing carbon emissions and maximising the use of domestic fossil fuels without carbon capture and storage, i.e. maximising them. 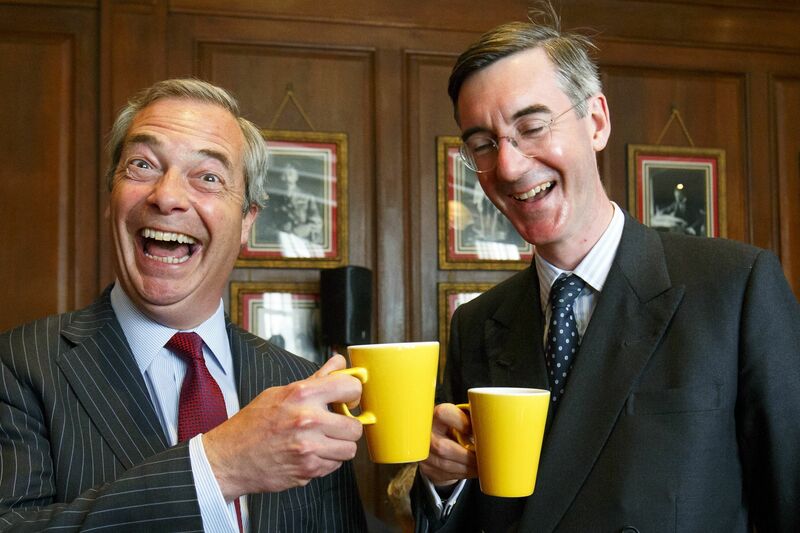 Mr Jacob Rees-Mogg, MP for the Chew Valley and climate sceptic, has said that it is a choice between “cheap energy” and “living in the stone-age” – a false dichotomy that ignores environmental costs and fossil fuel subsidies. He says that we should only adapt to climate change (I thought he denied it? Ed.) rather than mitigate further change by reducing emissions, suggesting that we take a leaf out the the Dutch book by building the sea defences higher and higher – as the Dutch “have done for hundreds of years”. He selectively forgets that historically the Dutch drained their land using windmills, an option not available in England as Mr Rees-Mogg has played his part in ending onshore wind – the least costly renewable energy. Another conundrum for the Secretary of State – how to deliver carbon reduction targets at least cost whilst at the same time closing down the least cost renewable option? – onshore wind. So, as a politician does Mr Rees-Mogg pretend not to hear what science is saying about the climate (“the quasi religious Green movement” with its “environmentalist obsession”), or does he simply just not understand it? Perhaps he is listening too much to Christopher Booker’s climate myths rather than spending any time engaging with science and people like James Hanson, who not only understands the science but who also advocates a market solution – another thing (surprisingly) Rees-Mogg doesn’t bother with unless massive fossil fuel subsidies are included. Ask a NASA scientist – or any of the 97% of climate scientists who have published and expressed a position on global warming. The industry funded Task Force on Shale Gas has today released its third report Assessing the Impact of Shale Gas on Climate Change. The task force report conveniently ignores global cumulative emissions which are what actually matters. For a full analysis and commentary on the task force’s climate change report have a look at Carbon Brief’s take on it. The potential impacts of climate change and in particular sea level rise on Somerset are profound. Let’s hope that DECC (read George Osbourne who has actually taken oven energy policy) will stop listening to this so called task force and start listening to its scientific advisors, the Environmental Audit Committee and the Committee on Climate Change whose job it is to provide this kind of advice without first filtering it through a gas industry prism. However, Ministers seem to prefer to trumpet the views of the task force rather than their statutory advisors.